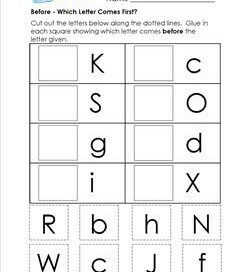 In this before worksheet the letters are already provided. Kids circle the letter that comes before the letter in darkest print. Optional: Color the bees in between each row in a pattern. “Reading” from left to right, kids circle the number that comes before the number in darkest print. Have kids read and say the numbers out loud! Color. This before worksheet is just too pretty in my opinion! 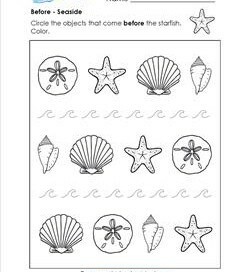 Kids circle the objects that come before the starfish and color the dreamy shells and waves. Before – Which Letter Comes First? Cut out the letters along the dotted lines & glue in each square showing which letter comes before the letter given. These are case sensitive! Before – Which Number Comes First? Cut out the numbers along the dotted lines. 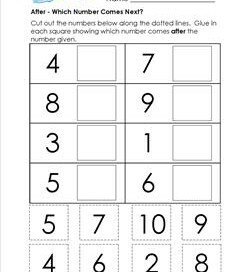 Glue in each square showing which number comes before the number given. Have fun! 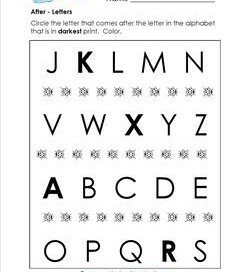 Kids circle the letter that comes after the letter in darkest print in this after worksheet. Then they can color the ladybugs if they want to, or if you say so! 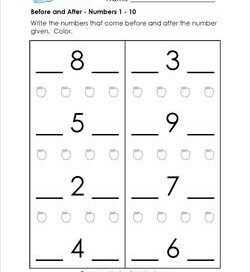 This after worksheet has all the numbers needed on the page. Circle the number that comes after the number in darkest print. 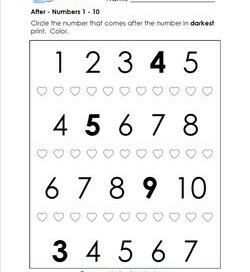 Kids can color the hearts if they want to. 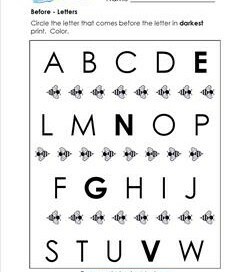 In this after worksheet the object that comes after is found by “reading” from left to right. 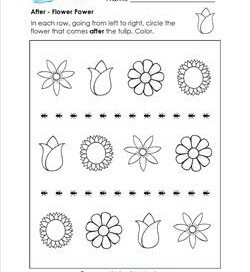 In each row circle the flower that comes after the tulip. Color the flowers. After – Which Letter Comes Next? 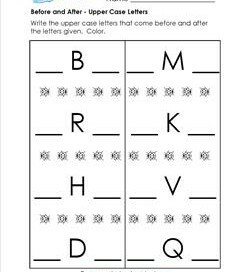 For this after worksheet the upper and lower case letters match their own kind. Kids cut out the letters and glue showing which letter comes next. After – Which Number Comes Next? 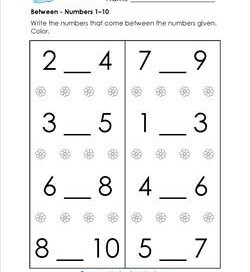 Kids may need a number line for this after worksheet. They cut out the squares and glue on showing which number comes after the number given. It’s time for before AND after not just before or after. Write the numbers that come before and after the number given. If desired, color the apples in a pattern. 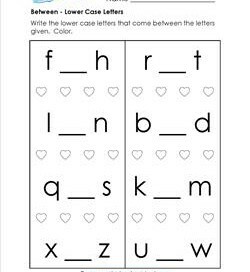 Make sure kids write only lower case letters in this before and after worksheet. 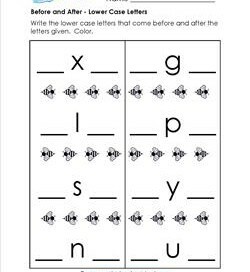 Write the lower case letters that come before and after the letters given. Be nice to the ladybugs! Maybe they’ll help you write the upper case letters that come before and after the letters given. Color the ladybugs in a pattern. 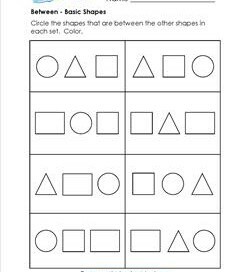 In this between worksheet kids color the shapes that are between the other shapes in each set. That’s easy! It’s always going to be the shape in the middle. Color. 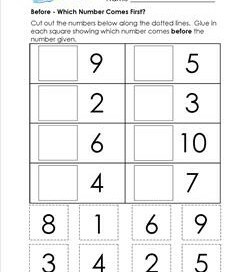 Fingers can be used to count in this between worksheet. Of course, unless the teacher says so! 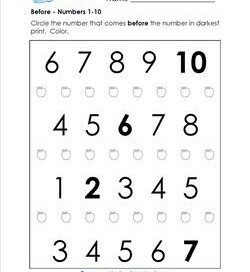 Kids write the numbers that come between the numbers given. Color. 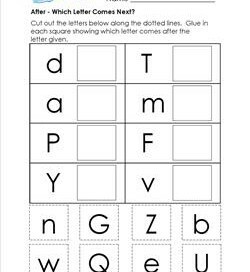 Try to see if kids can fill in the blanks without looking at the alphabet. Here’s where the abc song comes in handy! Write the lower case letters between the letters given.